Arctic Carpet Lawn Mix, Alaska's Time Tested Brand, is a premium lawn mix from Denali Seed Company and available at your local Fred Meyer stores throughout Alaska. OUR MISSION: To supply gardeners with quality, farm fresh seed at a reasonable price and only offer varieties that have proven their performance in Alaska's far north climate. All varieties sold by Denali Seed Company have been field tested in Alaska to prove they perform well in short season, cool climate areas and under arctic and sub-arctic growing conditions. DENALI SEED COMPANY, a LOCAL ALASKAN COMPANY, has been based in Anchorage since 1977. Our warehouse has been at the same South Anchorage location since 1981. For over 38 years Denali Seed Company has supplied garden seed to Alaskan gardeners. OUR QUALITY and SELECTION has never been BETTER. Denali Seed orders are shipped directly to you from our environmentally controlled warehouse in ANCHORAGE. Our seed is never displayed in a showroom where it can be EXPOSED to the FUMES from HERBICIDES and other GARDEN CHEMICALS that can LOWER SEED GERMINATION. When you can smell chemical fumes they can be harmful to seed, seeds are living plants. ALL SEED shipped from DENALI SEED COMPANY is NATURAL, NO CHEMICALS are used and seed is UNTREATED. Denali Seed DOES NOT SELL seed for GENETICALLY ENGINEERED varieties commonly referred as GMO's. We offer SPECIALITY VARIETIES for Alaskan gardens. We sell varieties that were bred in and for Alaska and others developed in simular climates throughout the world. These varieties are available only at Denali Seed Company. 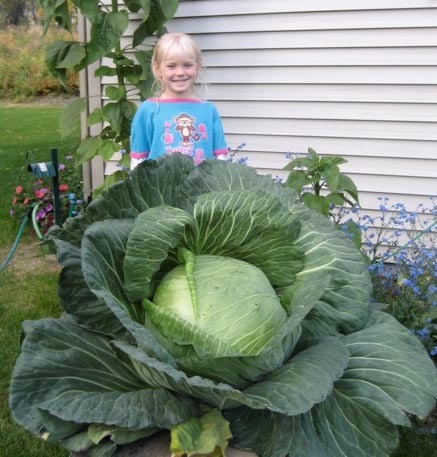 O-S Cross Cabbage is a high-quality, bolt-resistant hybrid that produces enormous flat-topped exhibition-sized heads that often attain 70 plus pounds when grown under Alaska's long summer days. This variety has been known to grow to 25 pounds under the shorter days found in the continental 48 states. It is a show-stopper in any garden and a county fair winner. These heads will be the talk of the neighborhood and are often grown as an ornamental in flowerbeds for show-and-tell. When harvested smaller it is an excellent variety for use fresh and cooked or to make sauerkraut. Denali Seed Company offers heirloom, open pollinated, organic and hybrid seed for annual, biennial, and perennial flowers, wildflowers, herbs, oriental favorites and traditional vegetables that include varieties offered exclusively by Denali Seed Company. Some Denali varieties were bred in Alaska for Alaskan growing conditions. All our seed varieties have been performance tested in Alaska to assure success in Alaskan gardens and preform well in arctic gardens, sub-arctic gardens, high altitude gardens, northern gardens and when used for northern greenhouse gardening. We are always testing new varieties to see if they perform satisfactorily in Alaska. We need volunteers to help us by growing these varieties in their garden for evaluation. Our goal is to help gardeners excel when growing a garden in cool, short season areas, in cold soils and during long summer days. For your assistance our veteran Arctic horticulturist, Reg Yaple, wrote the Alaska growing instructions "growing tips" for all varieties sold by Denali Seed Company and are found on our Bestcoolseeds website. You will also find gardening articles specific to gardening in Alaska that range from "Growing a Garden on Permafrost" to "A Guide to Seed Planting Depths when Growing in Cold Soils". Reg Yaple has published numerous garden articles and wrote the original University of Alaska Cooperative Extension Service booklet, "16 Easy Steps to Gardening in Alaska". Information on Alaska's Botanical Gardens, where to enjoy garden related activities or to join one of the numerous garden clubs in Alaska.